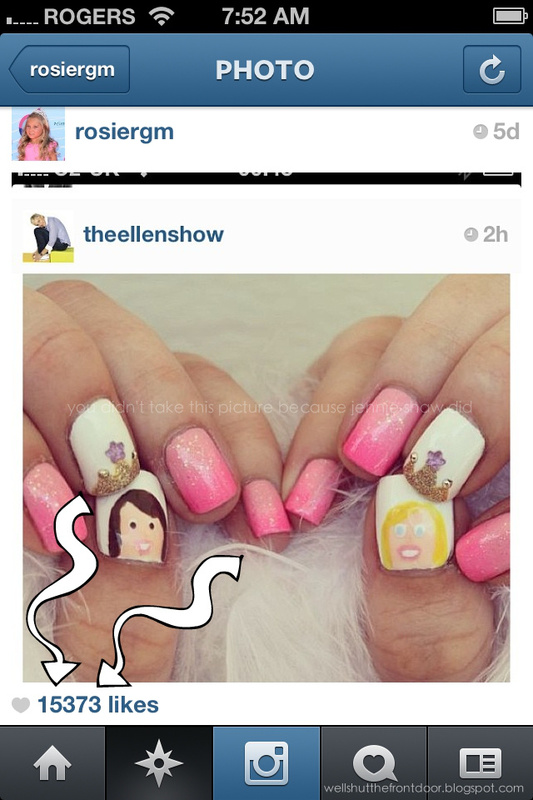 jennie's nails and tales: I'm Legit (Anonymously) Famous, Guys. 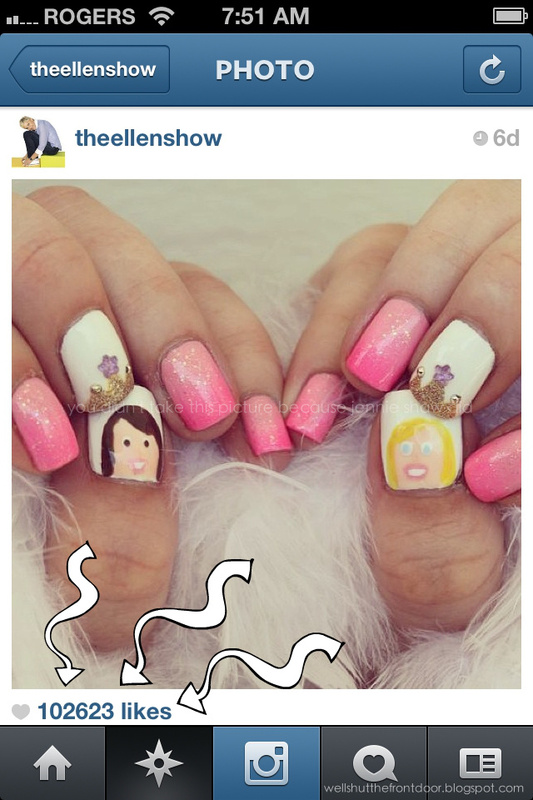 As I'm sure you know (because I've been blaring it all over social media) a manicure I sent into the Ellen Show, featuring the adorable Sophia Grace and Rosie, was chosen to be featured on Ellen's website. I was beyond surprised (and super-freaking-psyched) and for the last week or so, I've compulsively checked it about one kazillion times just to make sure that it was really happening. To be honest, even now, it still feels like an out-of-body experience because it's pretty much one of the coolest things that's ever happened to me. I mean, it's Ellen, for crying out loud. Then, a couple of days ago, my Mum sent me an email, wondering if I'd been keeping track of Ellen and Rosie's Instagram accounts. Since my answer was no, she told me that I had to go check it out THAT VERY SECOND. Her enthusiasm leapt off the page so, obviously, I went on over. AND THEN MY BRAIN EXPLODED! Over ONE HUNDRED THOUSAND likes?!?! That's, like, almost twice the capacity of The Rogers Centre! Or almost twice the population of Fredericton! And if that wasn't enough, the only picture with more likes on Ellen's account than my mani was one of Beyoncé's new haircut, which basically means that I am almost as popular as BEYONCÉ!! So although I didn't get any credit (aside from "Jennie S. from Hanwell, New Brunswick") I think that it's safe to say that I'm famous (albeit anonymously). YOU ARE SUCH A BIG DEAL!!!!!!!!!!!! When you become Manicurist to the Stars, I will tell everyone I knew you (anonymously, online) before you were a BFD (big effing deal). DAMN GIRL!!!!!!!! #BitchesBeLike...... WHY ISN'T YOUR "YOU DIDN'T TAKE THIS PICTURE BECAUSE JENNIE SHAW DID" WATERMARK ON THERE?!?!?! You should comment on all those pages/IG pics and post your links to let everyone know where to find you! Skeeter wants her maple syrup now. And I want a manicure with Channing Tatum on it. Wow congratulations, that's a big deal! So I'm behind on blogs and didn't realize this was you and I AM ONE OF THOSE 100k+ LIKES! HAHA! Insane! I'm so proud of you, my anonymously famous friend!!! Sniff!!! They grow up so quickly! Don't forget us little people!!! Well congratulations!! That is EPIC!